← Do yourself a favour and get along to the MCG! Two thirds of the season in the books. There have been a few surprising changes to the ladder but not at this end. This week I’m covering the bottom of the ladder and for most teams it is a tale of woe and underachievement. Next week I’ll cover the top 8. And then I’m off to Thailand and Malaysia. Nice. Abysmal. Just abysmal and the Hunter deserves better. They haven’t won since round 6 and while they have shown fight on occasion, some weeks the score line has been horrendous (vs Sharks – 62, vs Cowboys – 46 and vs Warriors – 50). They are really missing the veteran leadership that Kurt Gidley once provided. Nathan Ross has been a good find. Ditto the Saifiti twins. Dane Gagai is also playing well but that is pretty much it. No real sign that they are rebuilding either. Akuila Uate is parked in reserve grade and they let Tariq Sims go to the Dragons mid-season. Nathan Ross – Ross is your prototypical late bloomer. He has been banging around in the Newcastle club competition for eons with a couple of detours to France and the Gold Coast but is finally gaining some traction. He is in good form this year. Unlike the Knights. The Knights are really playing for the future now. The players will be looking to secure contracts. Nathan Brown will be hoping Newcastle doesn’t hire a 4th coach in 4 years and the team is auditioning for a new owner. Other than that, the season is a write off. To even make the 8 this year, the Roosters really needed to put a streak of wins together during the Origin period. That just didn’t happen and while there have been many excuses for the Roosters, it has been hard to put your finger on just what is wrong with them. 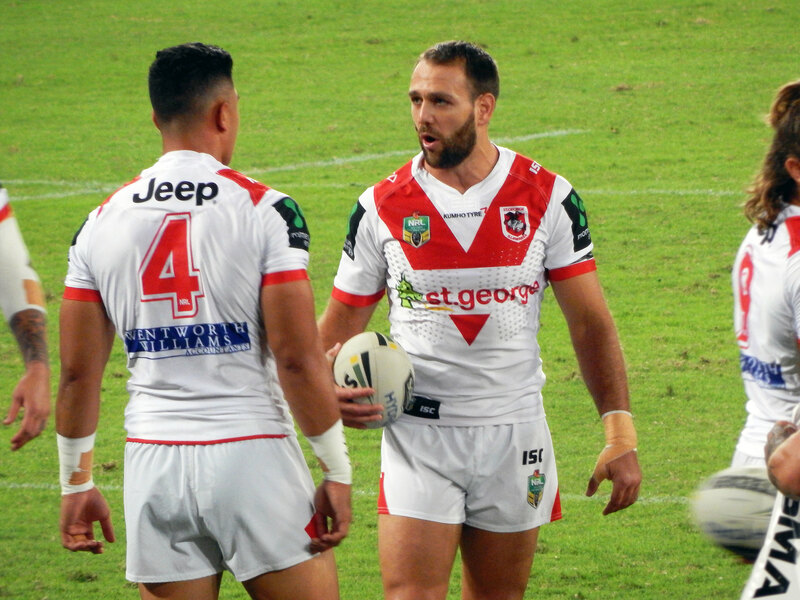 Mitchell Pearce came back from suspension and was immediately injured. They got Boyd Cordner back from injury and then lost him again to injury. Jared Waerea-Hargreaves returned from injury but hasn’t had a massive impact. Jackson Hastings is suffering some growing pains but he is not on his own in that regard. The Roosters are still far short of their best. Dylan Napa – Probably should have given Napa my first trimester MVP instead of Blake Ferguson but I’ll give Napa a belated nod for the Second Trimester instead. He is seasoning into a top notch forward in attack and defence but he is particularly ferocious in defence. Their season is gone. They are 4 wins out of the 8 and their run home includes vs Sharks (twice), vs Storm, vs Cowboys, vs Eels and vs Broncos so Murderer’s Row basically. They will eventually get their act together and sting some sides but annoying spoiler is the high water mark in 2016. Losing touch with the 8 now. They finally realised that Dylan Walker is an outstanding outside back but not quite ready for the halves. Unfortunately, they realised this right about the time that DCE went down with an injury so that wasn’t exactly helpful. Lost their last 7 games and while they have been in every single game this isn’t the level of play Sea Eagles fans are used to. Tom Trbojevic – Quick and elusive, Trbojevic is really emerging as a star of the future. This is pretty much a rebuilding year for the Sea Eagles and they are clearly a piece or two short of a premiership threat. Manly has a fairly decent core emerging around DCE including Matt Parcell, Jake Trbojevic, Tom Trbojevic, Dylan Walker and Marty Taupau but will need a replacement for Jamie Lyon. Brett Stewart and Steve Matai are also starting to seriously decline. Both have many kilometres on the clock and injuries are becoming a regular occurrence. They appear to be at least one, if not two, play makers short too. Some really underrated big units are starting to emerge though, with Siosaia Vave, Addison Demetriou and Addin Fonua-Blake giving the Sea Eagles a very Parramatta-Lite look when it comes to the pack, especially the second unit. For instance, Manly’s fightback against the Cows last week was entirely bench inspired. The Second Trimester is moving time if you have the cattle to do it and Souths threw up a mixed bag with 2 wins and 3 losses. Probably the most telling thing is that Sam Burgess seems flat. Maybe he is injured, maybe other teams are aiming up against him, I don’t know what the story is, but one season away from the NRL has not done him any good. It is pretty much a similar story for the Bunnies. They seem a team in decline. Gutted after 2014, the salary cap has bitten hard. The only good news story seems to be Cody Walker. He continues to impress. It is the year of the late bloomer. Cody Walker – GI and Sam Burgess are pretty much playing a lone hand along with this man. Walker has had stints in the Titans, Panthers and Storm systems prior to the Bunnies, plying his wares in the second tier competitions in NSW and QLD. He is proving his early season form is no fluke and is one of the lone bright lights for the Bunnies this year. Grim. They have the talent to sneak into the 8 but their run home is no easy feat either. Just haven’t exhibited anything like the form they need to claw their way back into contention. They just don’t seem to be a destination of choice anymore either so it might be ever diminishing returns until they hit the reset button. GI deserves better. Maybe he should sign up for the Cowboys. Treading water can sometimes be a good thing and that is what the Tigers are doing. Wins against the Broncos, Knights and Rabbitohs were offset with losses against the Bulldogs, Roosters and Storm (though that involved a stirring fightback) but the big news is Luke Brooks and Mitchell Moses exercised their player-favoured options to remain Tigers for 2017. Big win for the Tigers. Woods is leading a largely unheralded pack of forwards. Elijah Taylor is an outstanding mid-season pick up. Tedesco is back on deck after injury and makes a massive difference. Moses and Brooks continue to impress. Mitchell Moses – Often viewed as the poor cousin to his more illustrious halves partner but it is Moses who has been the star of the show this season. The Tigers will be looking to lock both of them up long term. They don’t have much in the way of injuries and they are within striking distance of the 8 but this will be another growing year for the Tigers. They could catch fire of course and streak into the 8 circa 2005 style but it seems unlikely. More likely will be a ‘win one lose one’ approach for the rest of the season. Mixed bag for the Warriors but they finally look like they are playing with some form after 3 wins on the trot (including vs Broncos) and a golden point loss to the Sharks at Southern Cross Group Stadium (add another name to the long list of Cronulla stadium names). Tui Lolohea has played well, as has Shaun Johnson and Isaac Luke is finally showing some signs of life. Thomas Leuluai is finally back which helps immeasurably. David Fusitu’a’s form has been pleasing as well. They definitely won’t reach the heady heights of where I had them pegged pre-season but at least they are competitive again. Tui Lolohea – Elusive and equally at home at Fullback or in the halves, Lolohea has stepped it up a gear in his second full season for the Warriors. Played for Tonga this year but the Kiwis will definitely have him on their radar as well. Should make the 8 but will they? They don’t have a terribly challenging run home with only the Cowboys and Eels of note but that hasn’t stopped them missing out on the finals before. Can’t shake my early season thoughts that they will sneak into the top 4 but that would be unlikely. I suspect they might just make the finals and that will be all she wrote for them. Things are finally looking sunnier on the Coast. Or at least things might have bottomed out. Ryan James – His continued good form is reflected in the Dally M voting where he has rocketed to the top of the leader board on 16 points in a tie with Cooper Cronk, Cameron Smith and Jason Taumalolo. How he didn’t get a jersey for the first 2 Origins is beyond me. I know one thing. If he was a Queenslander, he would have been on the team by now. They have a fairly lengthy injury list and a mixed run home so no certainty to make the top 8. Just the fact that they are competing for a spot in the 8 is a step in the right direction. The Eels impending salary cap penalty will help matters. I think they will just miss out. Really took advantage of the Origin period to knock over both the Storm and the Cowboys (thank you NRL Draw) and find themselves technically in the 8 given the Eels are dead men walking. They are a good side without being a great side. Still only averaging 13.9 points a game so it is safe to say their attack has room for improvement and they are hardly locking teams down on defence either. Picked up Tariq Sims mid-season which is handy. Josh Dugan, Benji Marshall, Gareth Widdop and Mitch Rein have been the standouts with Tyson Frizell the leader in the forwards. Tyson Frizell – Frizell was rewarded with a sky blue jersey which reflected his continued good form at club level. Competing with the likes of the Panthers, Raiders, Titans and Warriors for the last few spots in the 8 they fall into the category of making up the numbers. That was better than most pundits were predicting in the pre-season so it is hardly disastrous but no doubt Dragons fans hope for better. Ben Simmons, Thon Maker and the NBA Draft in general. Compelling viewing. Can’t wait till Summer League starts. Euro 2016 – Still awesome. Iceland, Poland and Wales have overachieved. Good ways. Portugal are massively underperforming….again. Belgium has finally logged a good performance. Germany, Italy and France are deserved favourites. Can I keep getting up at 5:00am in the morning on my weekends? That is the real question. Next exciting episode will be on Monday, 11 July 2016 titled ‘2016 NRL Second Trimester Report Part 2 – Just Trying to make it through Origin’.